The Pride of Canada Carousel, a one of a kind, rideable, fine art, nationally themed merry-go-round is set to make its public debut at a celebration on Canada Day, July 1, Noon - 5PM. The artistic piece was created by Canadian-born, California-based urban folk artist Patrick Amiot. 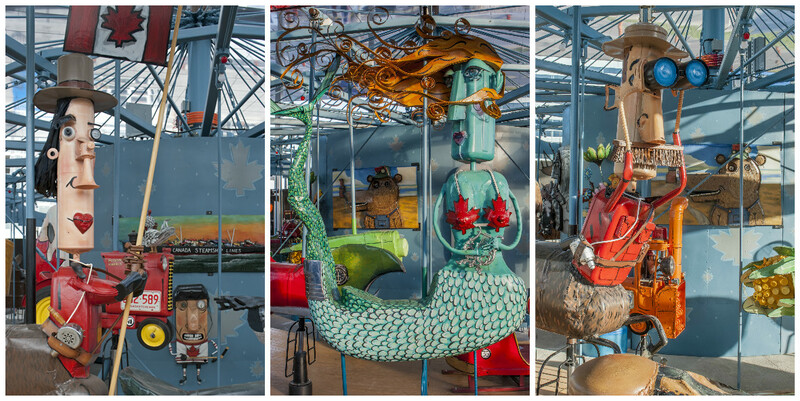 The interactive, eco-friendly carousel (it's made from repurposed materials) features 120 works of art. It's located at 8080 Birchmount Rd. in Downtown Markham (Ontario, Canada). "Patrick's remarkable sculptures celebrate our culture, geography and history with an unrivaled joy while offering a Canadian history lesson in a unique and entertaining fashion," said Shelley M. Shier, Art Consultant/Curator for Concepts and Acquisitions, Remington Contemporary Art Collection. "There is not another carousel like this anywhere in the world. Its appeal is universal and generational." The Pride of Canada Carousel is many things – a piece of kinetic art, whimsy and engineering in motion, a joyful lifestyle connection to tradition and a bucket list destination for globetrotters who seek an old-fashioned ride on a 21st Century Carousel. The legendary Daniel Horenberger of Brass Ring Carousel Company built the Carousel structure. Some of his notable carousels include Disneyland’s King Arthur Carrousel and the General Electric solar-powered Carousolar. The Pride of Canada Carousel is housed in a dramatic open glass pavilion designed by acclaimed Toronto-based architect Sheldon Levitt of Quadrangle Architects, Ltd. and will serve as a cultural anchor and meeting place in the 243-acre Downtown Markham development.